A lot of experts who were commentating during the game had varied views and there has been a split opinion if it was out or not. While the first Ashes Test at the Gabba has been a smooth sail with no major incidents or controversies for the first four days one just stirred towards the end of England‘s second innings. 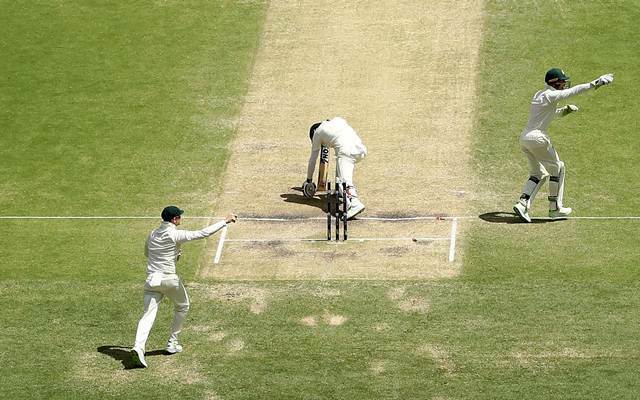 All-rounder Moeen Ali who was batting on 40 missed one from Nathan Lyon and Tim Paine collected it smoothly and took the bails off in a swift motion. Paine looked confident that Moeen might have just been out of the crease, the square leg umpire asked help from the TV umpire Chris Gaffaney. He watched the footage from multiple angles and in normal as well as slow motion. What made the decision so difficult was the fact that the area of the crease where he had plated his foot had curved in. From one angle it looked like it was just on the line but other gave a sense that it might be millimetres in. Gaffaney took his time and eventually decided that Moeen didn’t manage to drag his foot behind the line before the bails were off and thus ruled it in favour of the bowling team. The wicket triggered a collapse and from 154/5 England were bowled out for 195. A lot of experts who were commentating during the game had varied views while Michael Clarke felt the decision should have gone in favour of the batsman giving him the benefit of doubt, Shane Warne was of the opinion that the correct decision was made. After the end of the day’s play as Australia stand just 56 runs away from taking a lead in the series Moeen walked out to talk to the reporters. The most important question darted at him was asking for his opinion on the matter since there was no consensus on the outside. “If I was bowling I would want it out. I guess you got to look at it based on the angle. You have to respect the umpire’s call and what he saw,” Moeen Ali said. “I thought I was alright personally, but when I saw the replays it looked really tight,” he added.